China – bubble or no bubble? April 26, 2010 / 7 Comments on China – bubble or no bubble? China’s real estate bubble is of great concern to many people. Today, I want to entertain you with two contrast views on China’s real estate and housing market. First group holds the view that China is experiencing no asset bubble in housing market, or, similar to Japan in 1970s, the sharp rising of housing price is a reflection of strong housing demands coming from high population density and rapid urbanization. China’s housing market is hot, but it’s not a bubble on the verge of bursting, as many contend. Before we can discuss why it’s not a bubble, a little background on the Chinese housing market is needed. Prior to the early 1990s, urban dwellers in China were provided an apartment by their employers or the government, with rent set at less than 5 percent of their salary (utilities included). Starting in the early 1990s, the government began to privatize housing by selling apartments to their residents at a low price. Almost overnight it created a private home ownership rate of about 70 percent. This policy change was also a vast redistribution of wealth from the government to the people – those apartments typically occupied prime downtown locations, and thus are worth at least the price of a new luxury apartment. The price of housing in China has risen as the economy has expanded, but the chart from BCA Research shows that housing price growth has been significantly slower than GDP growth since the late 1980s. The price of housing has roughly doubled since the late 1990s, but it’s important to remember that China’s prices have risen from a much lower base than in the developed countries (among them, Britain, Ireland and Spain) in which bubbles were created. It’s also relevant to point out that household disposable income in China more than doubled during the period. The rise of the Chinese middle class is a major global economic phenomenon – tens of millions of people are added each year. Leverage is also an important indicator in judging how susceptible a housing market is to growing into a bubble. The chart below, also from BCA Research, shows debt as a percentage of disposable income in China and in a number of developed-market countries. More than half of the developed countries had debt in excess of income, with Denmark and Ireland pushing 200 percent. China is at the far other end, with debt totaling just 44 percent of disposable income. Furthermore, homebuyers in China put down at least 20 percent as a down payment (30 percent for a first-time buyer and 40 percent for a second-home buyer to damp down speculation). These buyers rarely fall behind on their mortgage payments. It’s obviously true that there has been rapid price appreciation in major cities like Shanghai and Beijing. Prices have risen above the affordability level for most families in these cities, and that is why the government is acting to let some air out of those markets before dangerous bubbles form. For example, the government’s “second mortgage rule” requiring much higher down payments is having some effect – in January, price appreciation rose less than 1 percent month-over-month, down from a 2.1 percent jump in December. The government has also ordered that developers build more economical homes. Where does the China housing market go from here? Home inventories are low in major cities – at the current sales pace, there are only a few months worth of inventory in Shanghai, and the situation isn’t much better in Beijing or Shenzhen (see chart below). But demand is still strong. A recent survey by the Hong Kong-based brokerage CLSA found that 56 percent of China’s middle-class families are considering buying a new home – despite the higher prices many families can pay a 30 percent down payment because of their higher savings. Our own research shows that property developers, coming off a good 2009, are expanding into second- and third-tier cities, where housing markets are also growing and prices are more affordable. This widening of opportunity, combined with the government’s early recognition that decisive measures were needed, together will raise the probability that it will achieve its goal of slowing down home price increases without causing the market to collapse. Another report comparing Japan and China from BoJ (Bank of Japan) also holds the similar view. Here is the Chinese version and English version of the BoJ report. (h/t Yuki Masujima). The other group, including myself, holds the view that China has a big real estate bubble waiting to burst. The only uncertainty is how big the impact will be. I argued many times before that because China is at a much different development level than Japan was, thus with much higher growth potential, meanwhile China is still closed to free international capital flows, the damage of the bubble burst won’t affect China’s long-term growth projection, i.e., in China, there won’t be a lost decade similar to what happened in Japan and the U.S.
1. NYT report on short seller Jim Chanos on his big bet against China. 2. 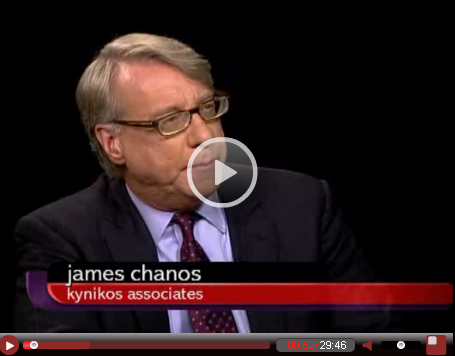 In this Charlie Rose interview (one of my favorite shows), Jim Chanos elaborate why he’s shorting China, and what he’s been watching on China bubble. Recent bubble pricking measures by China’s policy makers have had a big impact on the price of China’s real estate market. I think in general this is healthy for China – the earlier the bubble got deflated, the less damage will the bubble bursting do to the Chinese economy. As I said before, China stands at the forefront of bubble containing experiment. Let’s see how far the government measures can go…but so far, I like what I have seen. Here is the latest report from WSJ. The global economic recovery has drawn support from a swift rebound in China. Now, investors and economists wonder whether a bursting Chinese property bubble could put China’s economy in a bind. Over the past week, China’s cabinet has announced measures aimed at cracking down on property speculators, including tougher down-payment requirements for second and third homes. This comes after China reported an 11.7% rise in urban home prices last month from a year earlier, its fastest gain in five years. “This is the critical policy point that finally cracks the Chinese property market,” declared Morgan Stanley China strategist Jerry Lou. All this could be seen as bolstering the case for short-seller James Chanos. The name of Mr. Chanos’s $6 billion hedge fund, Kynikos Associates LP, means “cynic” in Greek—appropriate since the New York-based money manager earlier this year made himself the world’s best-known cynic when it comes to China’s growth story. “What we’re talking about is a world-class, if not the, world-class property bubble,” Mr. Chanos said in an interview with Charlie Rose, comparing conditions in Chinese cities to Dubai and Miami. He predicts the bubble will begin to unravel later this year. Mr. Chanos argues that China’s lending spree during the financial crisis has pumped too much money into real estate, and that housing prices have surpassed affordability. Among the counter-arguments: China’s growing wealth feeds a long-term demand to upgrade the country’s housing stock, and regulators put a tight cap on loan-to-value ratios, limiting the downside of any bubble. Some note that China’s government, using measures such as those announced in the last week, has long avoided a crash in housing prices. Those inclined to favor Mr. Chanos’s analysis—or who at least believe that some kind of correction is likely—could try to emulate his strategy. He is betting on a decline in the price of Hong Kong-listed Chinese property developers and other companies linked to China’s property market, such as those exporting cement and copper to China. (China’s regulators) set a 30% minimum down-payment for purchases of first homes larger than 90 square meters, and raised the down-payment requirement for second homes for the second time this year, to 50% from 40%. Relatively few buyers now qualify for the minimum down payment of 20%. In my view, China stands at the forefront of the policy experiment of pricking asset-bubbles. Many economists and central bankers hold the view that bubble is impossible to detect; instead, policy makers should focus on minimizing the damage in the aftermath of bubble bursting. Former Fed Chairman, Alan Greenspan, is one of them. The recent financial crisis taught us an important lesson, i.e., central bankers should take a pro-active role in containing the bubble – the damage left by bubble bursting is just too great to ignore, especially to the employment. China’s case is especially interesting – unlike Western central bankers, so far Chinese policy makers have largely relied on administrative measures, instead of the traditional policy instruments, like interest rates. I would think the new regulation on down-payment would be quite effective. However, it’s an open question how strictly Chinese policy makers would want to implement such policy; and how long and how far the policy makers would allow the price to fall, without worrying about the stability of the system – yes, I am talking about the stability of political system. If speculators know the government isn’t going to allow the price to fall (or fall too much), then this will eventually create a Moral Hazard problem – Next round, when new policy measures come about, real estate developers and speculators just hold up, accumulating housing inventories, anticipating the policy will soon reverse. This will essentially render polices ineffective. So all in all, we may never really get rid of bubble – as long as there is human greed and fear, and no matter which system you are living in – unregulated or heavily regulated.